Watches, glasses, handbags, … all these items are subjected to vibrations and shocks which “naturally” involve the loosening of the threaded fasteners. 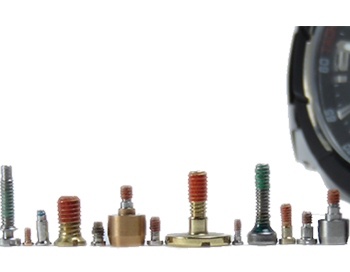 To replace the traditional dispensing of liquid threadlockers, we developed in the 80’s the coating process adapted to micro-screws S.0,7 to M2. The technique has been extended to the axles and other threaded parts. Today, our expertise is recognized by the major luxury brands worldwide. We process millions of pieces every year for famous watchmakers, eyeglass manufacturers, well-known sadlers and others leather goods industries and jewelers. 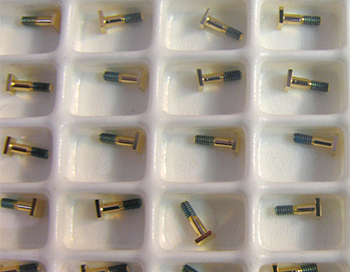 The technique consists in pre-coating the threads with a micro-encapsulated adhesive which is activated only while screwing. 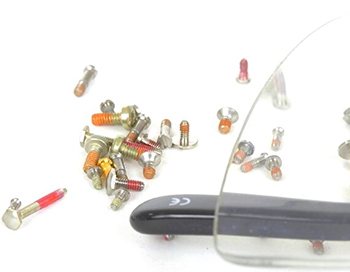 Upon assembly, the adhesive components are released and creates a bond between the male and female threads. It is the most effective and economical anti-locking solution. While screwing, the polyamide is compressed. The tension caused by the elastic strain of the product creates the locking effect. This patch is re-usable because the deformation of the polyamide is reversible and thus makes it possible to mount and dismount several times. The locking function is active immediately after assembly.